You have value—and not just as a good friend, loving family member, and upstanding member of society. You're also a valuable commodity that companies buy and sell. Your age, browsing habits, and friends lists are all hot properties. And yes, all this data is recorded, packaged, and sold to the highest bidder by your favorite websites. This shouldn't come as a surprise, of course. Advertising is the lifeblood of the Web, and without it we'd all have to pay for content that currently comes to us free. But make no mistake: Every time you surf a modern, advertising-supported website, you relinquish personal information to the site's advertising partners, which use this data to target particular ads to particular people. As a result, your private information has real-world value for pretty much every company that buys ads online. But suppose that you wanted to grab a piece of the data-sharing action? Could you reap direct profit by voluntarily, brazenly giving away your data to the highest bidder? Though big data collection rankles privacy advocates, if you're willing to play ball, you can share data on your own terms for fun and profit. 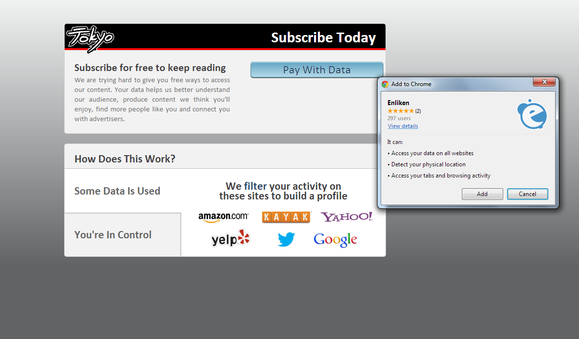 Of course, if you plan to turn a profit on your data, you need to know how much advertisers are willing to pay for it. This is not a new exercise. Published back in 2003, the SWIPE Toolkit is designed to help people understand the value of personal data; and though the data warehouses it draws from are a bit outdated, you can still use the SWIPE data calculator to get an idea of how much your information is worth on the data market. Plug in the information that you're asked to supply in exchange for a free Google account (birthday, gender, country of residence, mobile phone number, and email address) and the value of your profile adds up to roughly $12.50. Google collects some of that information to help you recover your account in case your security gets compromised. But the company also uses it to improve its services and to target ads more effectively. Wouldn't it be nice if Google paid you 12 bucks in exchange for that data? 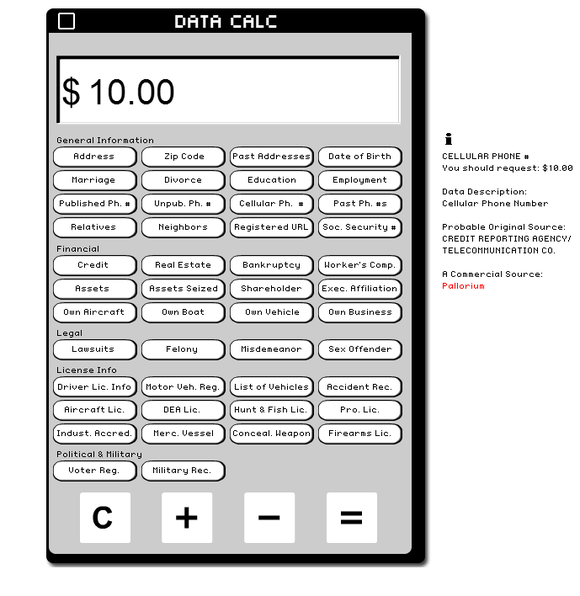 The SWIPE calculator estimates how much your private data is worth by estimating how much a data collection agency would charge for access to that information. Perversely, your private information isn't really worth that much unless it's bundled up with similar data about thousands of other people. After all, marketers don't really care about where you live or what TV shows you watch unless they can compare that information against a database of 10,000 other people to understand a specific audience better (and to sell products to it more effectively). Still, we can roughly estimate your value in today's big data economy by calculating how much money a given marketer (say, Google) makes from selling your eyeballs to advertisers. 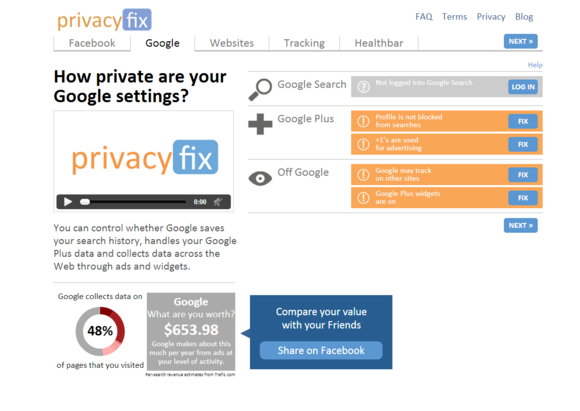 The free Privacyfix browser extension analyzes data stored in your browser, and then walks you step-by-step through the varieties of data you're sharing with Facebook, Google, and a truckload of online advertising networks that you've probably never heard of. Links in the report take you straight to the relevant privacy setting so you can quickly lock down your private info—a convenient safeguard if you're concerned about potential privacy breaches caused by bad guys working with easily accessible data-mining tools like Facebook Graph Search. Privacyfix estimates how much your personal data is worth and provides links to help you lock your information down. For the purposes of this article, we're concerned about cold, hard cash, and Privacyfix takes a stab at estimating how much money Facebook and Google make off of you every year based on your current privacy settings, the number of ads you see from those services, and what percentage of their revenue comes from online advertising (with the help of the financial analysts at Trefis.) According to Privacyfix, I'm worth more than $600 a year to Google but less than 50 cents to Facebook. The lion's share of that discrepancy comes from Google's significant ad revenue from search, which suggests that search history (what you want) is far more valuable to advertisers than your social graph (who you know). Still, PrivacyChoice founder Jim Brock is careful to point out that these numbers are purely hypothetical. "I love the idea of users being able to turn a profit on their data, but I just don’t think the world is set up for that," Brock says. He's right. I won't be collecting that $600 anytime soon, because there's no trusted method for individuals to exchange their personal information for Federal Reserve notes. It's not for lack of trying, though. Consider Enliken, a company that creates data exchange systems between consumers (us) and publishers (them). These systems allow publishers to grant access to content based on what personal information you're willing to share. Imagine a paywall like those on websites like the New York Times, except that, before you can read an article or watch a video, you have to answer a question about your shopping habits or provide a bit of personal information. The Enliken datawall lets you trade pieces of personal data for access to participating websites. 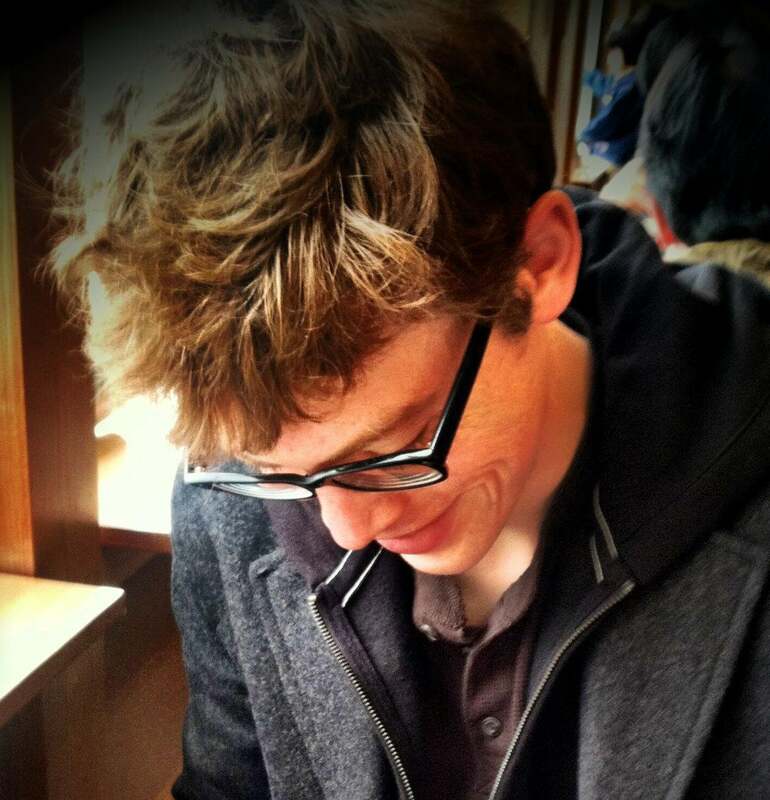 "We don't sell your data for money," says Marc Guldimann, founder of Enliken. "We use it as currency instead. It's our job to help people get comfortable trading data." Guldimann is betting that this voluntary exchange of data is better for everyone in the long run: Publishers will get better data about their audience, and the audience gets something it wants in return. Listening to Guldimann talk about data exchanges is like paging through a dusty copy of Neuromancer, but it's not science fiction. You can already reap rewards for voluntarily giving up your private data. Look no farther than Foursquare, which lets you trade your location data for discounts by checking in at participating retailers. Link your American Express card to your Foursquare account, and you can even get cash back on purchases when you check in at select locations, enabling you, in effect, to sell your body (in the form of a Foursquare check-in that your friends can see) for money. Of course, $10 is a pittance compared to the money Google is making off our search data. I don't know about you, but I wouldn't mind a cut of that estimated $600. 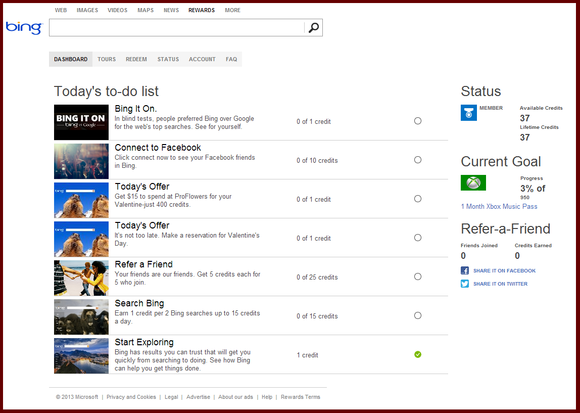 Sadly, though, the best I can get right now is $10 to $15 worth of gift cards from Microsoft in exchange for using Bing. The Bing Rewards program allows you rack up points for using Bing services, and while it's probably more valuable to Microsoft as a means of luring away Google diehards, it unmistakably establishes a clear exchange system of private data for profit. Earn points by conducting Bing searches, sharing your Facebook account, and pimping Bing to your friends, and then cash those points in for rewards like a $5 Amazon gift card or a month's subscription to the Xbox Music service (a $10 value). It's hardly a get-rich-quick scheme—but given how little Google pays us in exchange for our traffic, I'll take what I can get. Bing Rewards make it easy to trade your data for token rewards. To trade data more directly, check out Personal, an encrypted data exchange designed to let you securely store and share your private data for profit. It works by separating your (freely submitted) data into discrete "gems" that you can selectively share with specific people, specific companies, or the entire Personal network. For example, you could use it to send medical records to family members, publish your perfect martini recipe to the Personal database, or share your TV preferences with Hulu in exchange for a free month of Hulu Plus. Personal is still in beta, but it already allows you to commodify data and trade it with other users. Similar services are sure to follow, and if they prove themselves trustworthy and build up a large enough base of users to make retailers take notice, consumers will have the tools to take control of their data and start exchanging it for more than just a handful of coupons. Trading data for goods and services is the future. We're not quite there yet, but we can see it from here. Alex writes reviews, How-To Guides and features to help you work smarter and game harder.